The Sword of Justice, El’Druin is coming to life as a prop replica by NECA. This sword is 3½ feet long. The price is $59.99 and ships to your home on March 2014. Features blue LED light in the hilt. Only the righteous can wield this superb Diablo III El’Druin The Sword of Justice Prop Replica from Blizzard’s Diablo II video game! This recreation of Archangel Tyrael’s legendary weapon was built directly from digital files used in-game, and measures nearly 3 1/2-feet long. The sword features a pulsing blue LED light in the hilt, simulating the awesome protective powers the sword draws from the High Heavens. Each El’Druin sword is carefully crafted of ABS, plastic and PVC in a construction designed for durability and impact resistance. 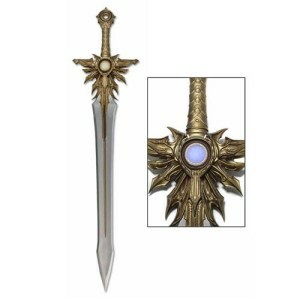 Hand-painted in gold and silver using a mix of washes and dry brushing to enhance the detail and metallic feel, the Diablo III El’Druin The Sword of Justice Prop Replica looks just like the real thing, but is perfectly safe.